After 8 glorious years of evolving and growing, we wanted to take a breath this year. This is the right time to take stock of what we've accomplished and make decisions about what we hope to do in the next 8 years. Our initial work centered on providing coordinated care for professional cyclists. It was a lofty idea which quickly became obviously impossible, so instead we decided to improve overall knowledge about cycling related conditions through a CME style conference. We threw together our first conference in 2010 in just about 4 months, and held it at a newly acquired bar at USA Cycling. The conference was magic, and we were hooked to improve the little slice of world through the newly minted Medicine of Cycling. The bar was dismantled and we held the next 3 conferences at US Olympic Center. We welcomed many interesting guests including great cyclists, the former UCI president Pat McQuaid, international team doctors, and always a crew of wonderful students and trainees who would go on to become our colleagues. We formed a strong working relationship with USA Cycling, supported by their staff and leadership throughout the various stages of conference and project planning. During those early conferences, a team of amazing clinicians came together to write the concussion guidelines and short form brain injury cards now translated and used by so many in the cycling world. Another group of clinicians formed the training epicenter of hands on emergency management for those who wanted to better serve in race communities. Such training is typically reserved for trauma surgeons and is often prohibitively expensive. 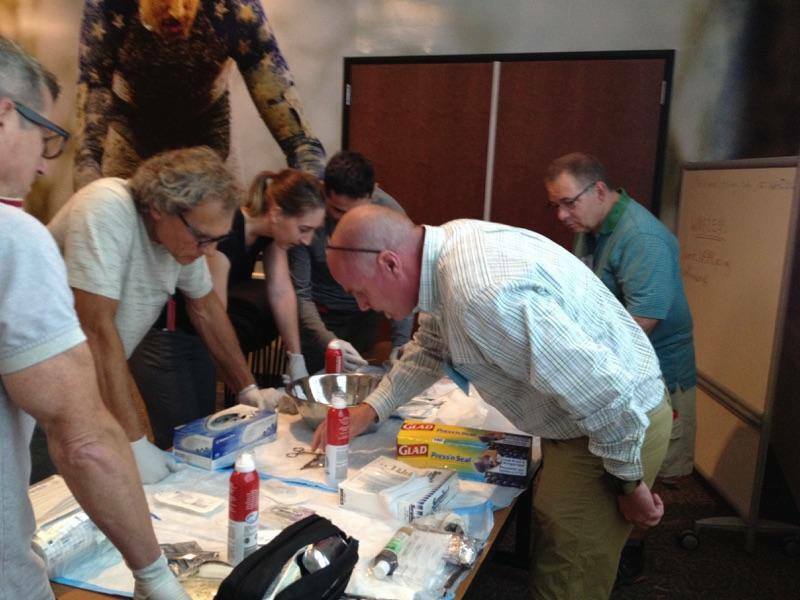 The MECC team transformed the training to include EMTs with life-like mannequins, pigs feet for realistic suturing, and specialized equipment to work with. One of the most amazing and gratifying MOC accomplishments came in the collaborative work of bike fit professionals. Bike fit underwent transformation from closed door silos to boisterous teams of experts teaching and learning to improve upon each area of person and bike. The bike fit group crossed all disciplines, company lines, and national borders to form it's own network of professional analysts. In 2013 we put together a mini-medical school for the public through UCSF, available for anyone to see on UCTV detailing the cycling related medical issues. These talks received well over a million views. We're repeating this mini-medical school February through April this year to give more information for the cycling community to stay well and well informed. MOCC returned to USA Cycling's new conference hall in 2014 and at the same time welcomed the researchers in cycling related sciences. Research in cycling is challenging and poorly funded. Those doing this research need a platform and support system to challenge the assumptions we have about cycling. The conference, research work, and all aspects of MOC have continued to evolve and grow. The organizers, volunteers, USA Cycling staff, and many of our attendees became friends we look forward to seeing at the conferences and chancing upon throughout the year. The community that formed around a shared passion is something we look forward to at least as much as the conference content. This year, we are challenging ourselves to do something bold. We want to transform MOC into a medical society to meet the needs of those who are part of this community. This community is diverse and has vastly different needs and interests. We look to you for input and possible involvement in MOC as we start to plan for the 2019 conference. KT Tape will sponsor Medicine of Cycling in 2017. KT Tape is the official kinesiology tape of USA Cycling through the 2020 Tokyo Olympic Games. You will be able to learn about the tape and sample the product line at the conference this year. Special Registration Offer win your conference registration fee back!! Posted in Uncategorized | Comments Off on Special Registration Offer win your conference registration fee back!! Prentice Steffen MD FAAEM from Cannondale-Drapac Pro Cycling Team will speak at the Medicine of Cycling Main Conference August 18-20 2017 in CO Springs. Dr. Steffen has the distinct honor of being the first American physician to serve as team physician for a team competing in the Tour de France in 2008. Dr Steffen has been a strong supporter of anti-doping efforts for years. He has worked 7 tours and has been traveling and caring for cycling teams since the 1992 Veulta a Colombia with the Coors Light Racing Team. He will be presenting a lecture on A Day in the Life of a World Tour Cycling Team Doctor. Dr Steffen will also be presenting an interactive session with Dr Kevin Reichlin on a Collaborative Approach to Management of a Professional Cycling Team. We have been hard at work planning the upcoming Medicine of Cycling Conference August 18-20, 2017 in CO Springs at USA Cycling. Word of mouth continues to be the most common way conference attendees find out about MOC, we would love for you to spread the word in your departments at work and local cycling communities. Here's an advertising sheet with all the information about the conference for you to share. CME CEU and PT credits will be available. Please use this link to register for the 2017 conference. If you are interested in attending the Medical Emergencies in Cycling course (MECC) on August 18, we urge you to register for that quickly as there are a limited number for spots available. The Bike Fit and Cycling Analysis Course topics and schedule have been adjusted based on your feedback. We now have more fitter topics and an exciting lineup of speakers. Researchers please submit your abstracts by May 1 2017. 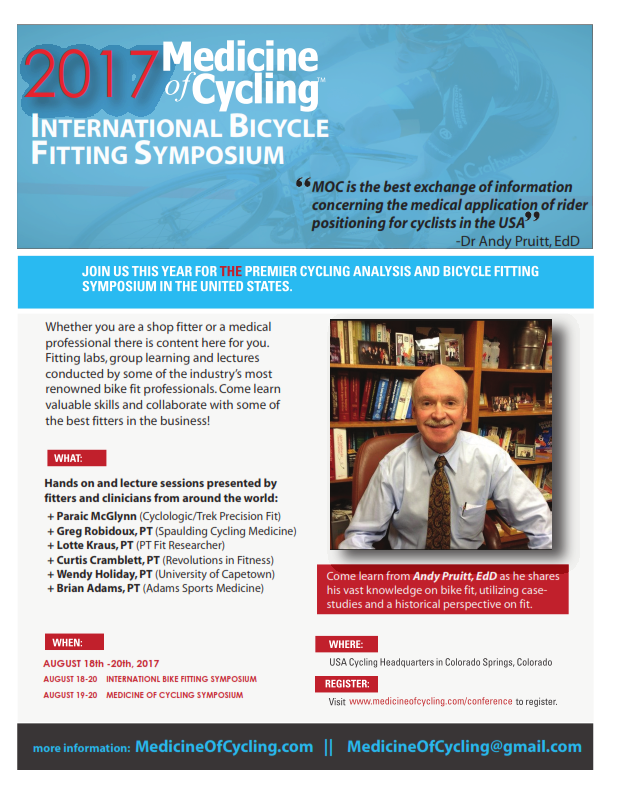 We will be selecting abstract winners to present at the 2017 Medicine of Cycling Conference in CO Springs early next month. Please follow this link for instructions on submitting your work. This year at Medicine of Cycling Happy Freedman will be presenting on the foot – shoe – pedal interface. Come find common problems and solutions for your cyclists. Orthotics, strength, wedges, shoes and more will be covered in this lecture and hands on presentation. As you might have seen we are doing case studies again this year. There was overwhelming excitement about the interactive model of learning across disciplines. Like last year we are asking YOU to bring a case study that you can share in a small group. Bring whatever data you want to share. It can be very very detailed with video, pictures, on and off bike evaluation information or just "I saw this client last week who …." What do you usually do with these people? In the next week or 2 start to capture these clients on paper or in your head and BRING them along. We look forward to seeing you at the conference and sharing the learning opportunities! Please share this flyer about Bike Fit! Medicine of Cycling is once again announcing a collaborative effort with the International Bike Fitting Institute (IBFI) to professionalize bike fitting and showcase the skills of those at the top of the industry. Experts in cycling-specific fields, including fitters and medical professionals working with Pro Tour athletes and teams, will be speaking on a variety of topics, as well as providing hands-on training in managing acute cycling injuries and bike fitting. The program is open to all professionals including MDs, paramedics, medical students, NPs, PAs, physical therapists, coaches, bike fitters and soigneurs. This unique academic symposium is led by Curtis Cramblett PT and serves as the non-partisan platform for information-sharing of valuable content for retail and medical bike fitters alike, with presenters from all fields of expertise. Discussions and presentations focus on anatomic and structural understanding, available tools, learning high and low-tech techniques to serve fitters, medical experts, and coaches at every level. 2:30 - 3:30 PM Barriers, Accommodations, and Interventions for "Getting Aero"
Please share this 1 page flyer on Bike Fit 2016 within your groups. We hope to see you there! Interested in Volunteering for MOCC 2016? We are looking for medical students who may want to attend MOCC 2016 as a volunteer. We need help with things like shuttling speakers to and from the airport, picking up coffee and supplies, assisting attendees and speakers and various other tasks. You would be free to be a part of the MOCC audience during down time. If you are interested in volunteering, please send us an email at medofcycling@gmail.com with your contact information. Posted in Uncategorized | Comments Off on Interested in Volunteering for MOCC 2016? We are excited to share with you our most updated schedule for MOCC 2016. We're busy finalizing details and hope you are making plans to join us in August! You can find more information about registration here. Let us know if you have any questions! © Medicine of Cycling 2013. "Medicine of Cycling" is a trademark of Medicine of Cycling, Inc. All rights reserved.